The last commercial lot in the South Buda Business Park subdivision is available for purchase at $4.00/square foot of land or $435,600. 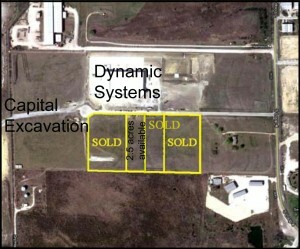 This land parcel is 2.5 acres in size and is located on Business Park Drive. The subdivision is located on the west side of FM 967 South (Loop 4) approximately 1,200 feet west of the intersection of FM 967 and IH-35. The lot has great access to the Interstate Highway. South Buda Business Park is located in Buda, just south of Austin, Texas, and near the new Seton Medical Center in Kyle, Texas. The property is a few miles South of Cabela’ s and an HEB Center to the north and Lowe’ s, Home Depot, and a Kyle, Texas HEB Center to the south. A detention pond is in place for the lot and 85% Impervious Cover is allowed (Buda standard for this zoning is 75%). The zoning for this property is I2 and this property is one of the few I2 zoned properties in Buda. The lot has Monarch Utilities water, gravity wastewater, and Time Warner fiber optic service. Dynamic Systems recently completed construction of a 114,000 sq. ft. manufacturing facility within the park, as well as Capital Excavation which constructed a 10,000 SF building at the rear of the South Buda Business Park property. Fat Quarter Shop purchased 6 acres and has recently completed construction. Click here for a link to a Flyer.